We all have days when we are tired of our jobs, and we wish we could just quit. However, just because you feel like quitting one day doesn’t mean it’s actually time to leave your job behind. Before you leave your job, you need to consider the personal and financial factors influencing your choice. Before you quit, make sure that the timing really is right. Your savings: Do you have adequate savings? If you had to live without your job, could you afford to? Before you change course, make sure that you have enough money saved up to make it work without a job, if you have to. Other sources of income: One of the reasons many people quit their jobs today is that a side hustle has become lucrative. Do you have another source of income to make up for what you are losing? If you have a life partner, does he or she have a job that can provide you with income? Another job lined up: If you plan to get a new job after you quit with your current employer, it makes sense to have that job already lined up. Plan ahead so that when you are ready to quit you have something else to do. Benefits: What benefits come with your current position? What will it cost to replace them. In the U.S., you have to think about health care benefits before you quit your job. Everything from paid sick days to gym discounts to child care help needs to be considered. You will have to pay to replace these benefits in some cases. Think about the financial situation before you quit your job. There are times when I think about cutting back on my work, but I need to feel a little bit better about my family’s financial situation before I make that move. The money situation has to be right before it’s time to quit your job. Do I feel like I’m accomplishing anything? Many of us like to feel as though we are accomplishing something worthwhile with our work. Do you feel like you’re doing something important? If you simple go to work, and feel as though you aren’t doing anything meaningful, it can start to weigh on you. It might be time to move on when you no longer enjoy a sense of purpose at your job. Can I grow anymore here? Another consideration is whether or not there is room for you to grow at your current job. Have you reached the highest point you can? If you can’t get promoted higher, or if there are other obstacles to career growth, it might be time to move on to another job — one that allows you to reach your potential. Don’t forget to consider whether or not you can grow as a person. Are there challenges to your job that can help you improve yourself? If not, it might be time to look for a job that offers a little more chance for personal growth. Am I ready for something different? In some cases, it’s more about being ready for something different. If the environment at your current job is toxic, there is a good chance that you need something different. Even if it’s not toxic, you still might benefit from different responsibilities. Sometimes, you just ned a change. The time to quit your job is when your financial needs and personal needs match up. If you can’t deal with quitting your job financially, then you might need to stick it out for a few more months until you find the right money solution. What do you think? 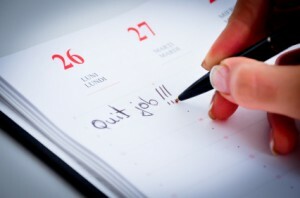 When do you know when to quit your job? I knew it was time to quit my job for personal reason but kept at it for another 6 months to build a bigger cushion. It can’t be done lightly. That’s so true. When you feel as though you can’t keep busy doing meaningful work, it’s time to move on. My jobs quit for me (both cases), so I was never put into this position. I do think that it’s not an easy move, but, as long as you keep in mind the tips you mentioned in your article and are mature about this, it should be OK.
My last day is tomorrow, and I just know that it’s time. I have my side business that is constantly growing, and my expenses are pretty low. I’m also done with this current career path! I definitely plan to quit my job pretty soon but I’m trying to stick it out so I can build my savings a little and get my business off of the ground. It’s hard but I’m going to try my best to stick it out at least six months. Great tips! As you mentioned, I would have another comparable or better job lined up before quitting my current job. And I doubt I will ever do that because I am highly compensated with good salary and great benefits where I am now. On the other hand, due to the Sequester, our division could be shut down or told to move to be consolidated with other divisions in the company. I have kept my resume polished, have a current LinkedIn page, and keep up with contacts in my professional network just in case. Good plan. It’s always a good idea to be ready ahead of time, rather than wait until things get ugly. I always made sure I had an emergency fund and a new job lined up before I’ve left an old job. It is so hard to get a job when you’re unemployed today that I wouldn’t leave without another job (or my next step) lined up. I do the same. You need to have a back up in place to be safe. I wrote a post on the five signs that one may have to quit their job; at the moment I think I can tick all boxes. It doesn’t mean I’ll do it but I have already mentioned at couple of conferences that I am on the market. Let’s see how this one works out :). Networking before hand works wonders. I have done the same and it is amazing what doors open up.